This page expands on the basic idea at the jabberwocks page. There are quite a number of rare (from a pro perspective) but interesting side patterns, based on the same plan: set up an ideal press or cover play in one corner, in relation with an enclosure positioned to take advantage. For example, here all Black's stones, and and the stones. are working together on a large scale. Although there are indeed not so many examples in pro games to study, there are some. These form interesting material from the point of view of framework theory. For instance, they often include use of a wedge on the side, and tenuki joseki. Since in the diagram fits in with many amateurs' ideas on the use of influence, these are instructive patterns to study. Of course one should also look at the whole board. 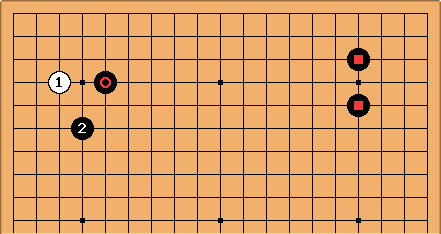 Often Black in playing this way is applying an ippoji strategy: omoyo play may cause panic in some opponents, but that doesn't mean it's sound. 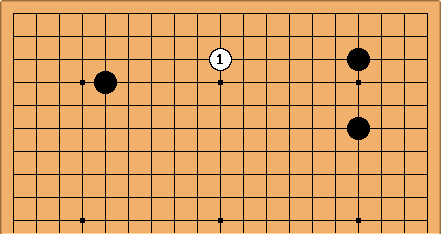 Therefore a technical discussion of how to play these sides is called-for. If White has some basic ideas on strategy here, it will be a great help. The options are the previous main choices with expected outcomes as before: plus White at c, in the corner. 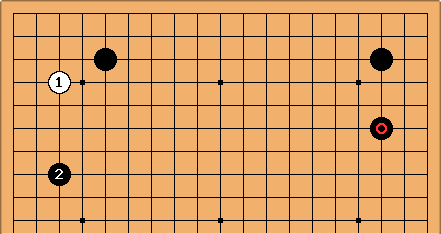 This was played in a game 2002-10-28 between Kubo Katsuaki and Yuki Satoshi (B); Black played the cover at b and an early struggle for a good ladder ensued, in relation to the lower right corner. This was played in a game Kobayashi Koichi-Otake Hideo (B) 1993-11-24. White came in at a and Black played the cover at b. 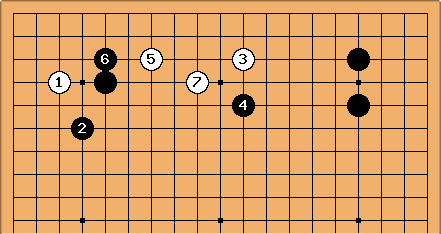 This pattern has been played by Miyazaki Shimako. 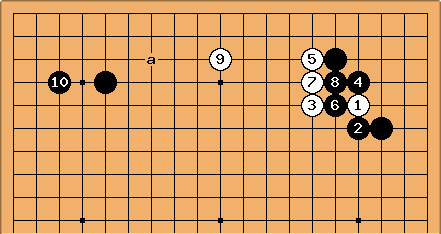 When White played a she played the taisha, and against White at b the contact play c (attach-extend). 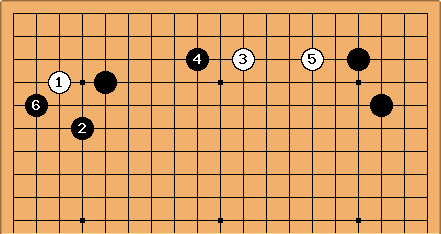 This pattern was played by Yamashita Keigo in 2000. White has played at a, and at b (to which he answered by taking the 3-3 point). Cho Hun-hyeon played at c.
See also strange opening from a pro game: a comparable position reached in a game Yi Ch'ang-ho (B)-Paek Tae-hyeon 2001-05-30, though with a 3564 enclosure. White allowed Black a second enclosure. White can of course avoid immediate difficulties by agreeing to a ryojimari game. This is from an Ishida magazine article. 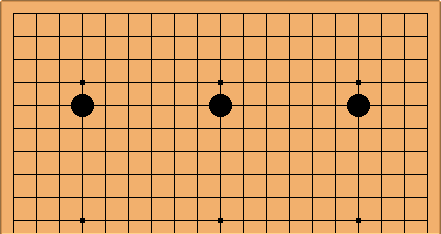 If Black is happy playing a 3564 enclosure the same type of formation can be set up from the (unorthodox) starting position. 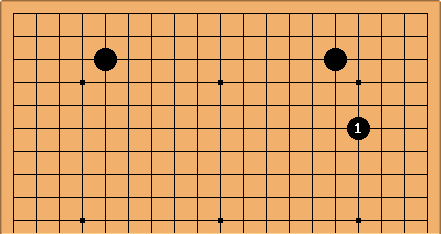 This was played (colours reversed) in a game 1982-06-29 Shao Zhenzhong-Kanda Ei (B). 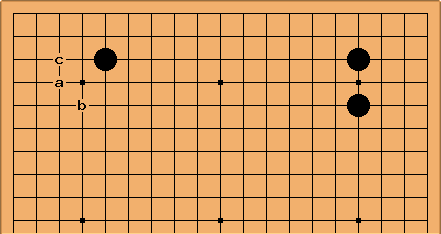 The stone had been played to limit influence in the lower right. Therefore isn't so surprising, to slow the game down. 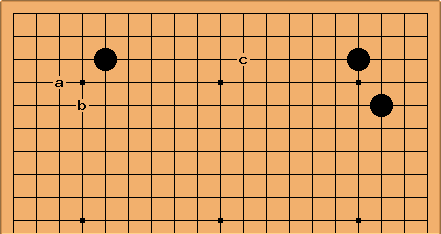 There are examples here of top players as White coming in at a or at b. From the young Cho Chikun as insei, playing Kasai Koji? (B) 1968-01-26. 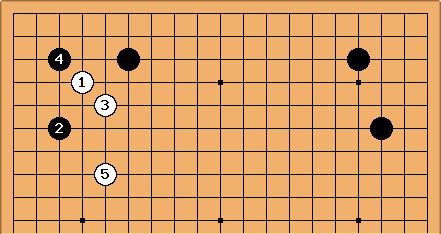 White combines a tenuki from the left corner and a wedge with . Kobayashi Koichi-Awaji Shuzo (B) 1989-10-18. 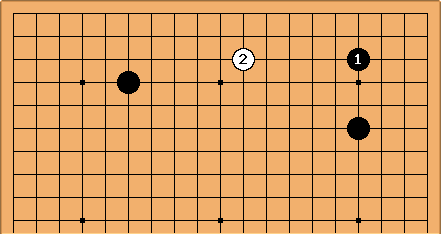 White plays to live quickly wth ; and then limits Black's framework with . 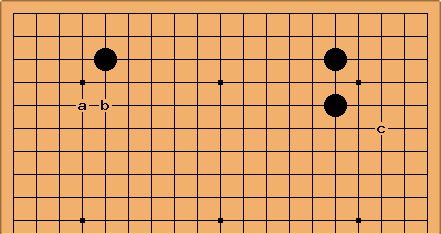 In this case the patterns are much the same for White coming in at a or b. This is from a game Hori Kentaro-Takagawa Kaku (B) 1934-09-16. 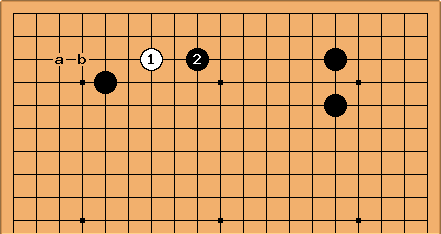 White concentrates on getting a live group: there is aji in both of Black's corners, so this is a classic plan. From Murase Shuho-Kuroda Shunsetsu 1879-06-25: another tenuki+wedge pattern. From a WAGC qualifier January 1982 Yang Jinhua-Cheng Xiaoliu: wedged immediately. 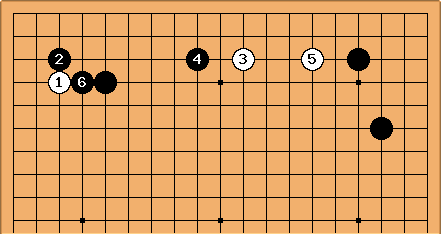 The correct wedge point is apparently 10-3 if played at once, 11-3 if White starts in the left-hand corner and plays tenuki. This, with colours reversed, is from Takagi Shoichi-Kudo Norio (B) 2000-09-21. The game continued Black a, White b, Black c, White d. This fourth-line short extension occurs also at 5-5 point. 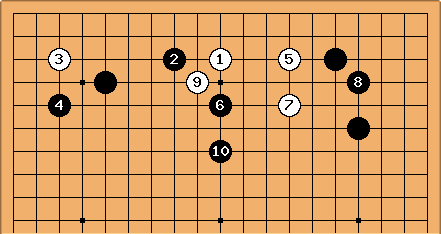 This formation has been used by Yamashita Keigo: leading to and . 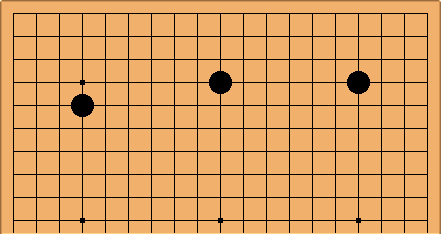 After White invades (at a or b) Black allowed White to connect to , building a wall on the left side. In a game Cho Hun-hyeon-Yi Ch'ang-ho (B) 1995-09-27 it went this way: in later fighting moving leftwards White put to use. 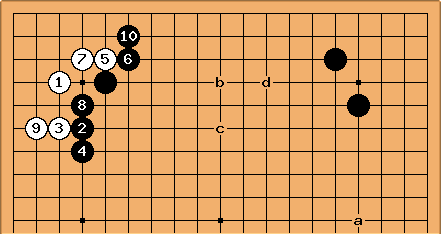 A game Yang Sang-kuk-Cho Hun-hyeon (B) from 1975 went a more conventional way, to begin with. White played tenuki after , permitting a black attack at . From Wang Lei Sr.-Qiu Jihong? (B) 1996-05-09. White plays straight for the vital point of the 3563 enclosure, and succeeds in settling a group with , and White 11 at a (immediate life). This is from Taiwan: Chen Yongan-Zhou Junxun (B) 1995-02-12. White plays into a double kakari; and then lightly out again. What follows was previously on the jabberwocks page. In this case the wedge 2 is useful for White, because Black then has two insecure corners. This is a good illustration of miai thinking. 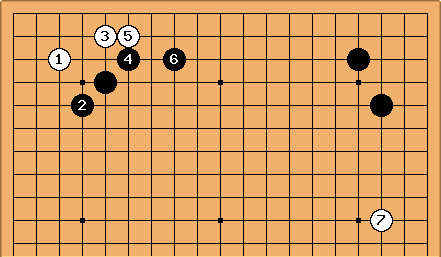 This was played by Go Seigen against Kitani Minoru in a three-game match sponsored by the Jiji Shinpo. Waltheri? doesn't have the date, but from the ranks of the players I've deduced that this game was played in 1933 or 1934. Kitani won by a convincing margin of seven points. 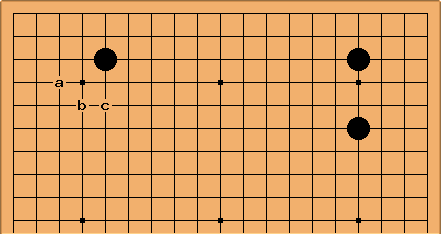 It cropped up again in 1968, played by Kikuchi Yasuro against Yasunaga Hajime. Yasunaga won by resignation. As we can see, there's apparently yet to be a professional win with this formation. This combination appears only a couple of times in Waltheri. 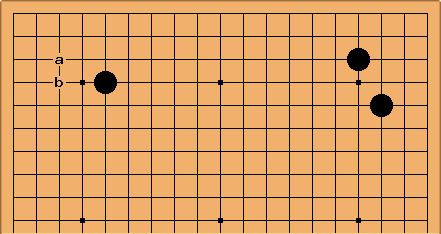 The first appearance was in 1935, played by Takagawa Kaku against Isogawa Masao. The second appearance was in 2000, played by Mok Jinseok against Weon Seongjin. 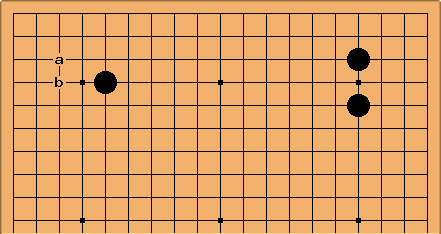 It last appeared in 2016, played by Kunisawa Hiroto against Nakano Yasuhiro. Hence the name of this page: Lewis Carroll wrote the poem Jabberwocky. Perhaps I should say that the idea of the 4-6 example is something I found in a book of Shirae Haruhiko.